Anna Gustafsdotter Banér was the wife of a privy councillor and is also believed to be the author of an eyewitness account of her father Gustav Banér’s last hours of life before he was executed at what became known as the Linköping Bloodbath in 1600. Anna Gustafsdotter Banér was born in 1585 at Djursholm castle in Stockholm. This castle was owned by the Banér family from 1508 until 1813. Anna Banér was the daughter of Count Gustav Axelsson Banér, privy councillor and regional governor, and his wife Countess Kristina Svantesdotter Sture. She was the second of 14 children. Two of her sisters and two of her brothers died in infancy. Four of her brothers became privy councillors, while she and her sister Märta Banér married privy councillors. The Banér family belonged to the landholding aristocracy with noble roots dating back to the Middle Ages and was closely entwined with the political elite of Sweden. When Anna Banér was 15 years old, her father Gustav was executed after being condemned to death at the Linköping parliament of 1600. This parliament represented the peak of Duke Karl’s (later King Karl IX) struggle against King Sigismund Vasa in his campaign to gain the Swedish throne. Along with twelve other council members of the Swedish aristocracy, Anna Banér’s father was sentenced to death for treason. Five of them were subsequently executed at Stora torget in Linköping in what came to be called the Linköping Bloodbath. Anna Banér is believed to be the author of the frequently cited letter which depicts her father’s last hours of life before his execution on Maundy Thursday 20 March 1600. She, along with her mother Kristina Sture and three of her siblings, were permitted to join Gustav Banér during his last days in prison. Later, in 1618, Anna Banér described the agonising night before the execution in a letter to her younger sister Sigrid Banér. The original letter has been lost but two copies survive. The identity of the author has been subject to much debate, not least as one of the copies is entitled “Christina Banér’s account”. However, none of Gustav Banér’s and Kristina Sture’s daughters was called Christina. Sigrid Banér has sometimes been named as the author of the letter, but at the time of events she would only have been eight years old. Meanwhile, Anna Banér was known to be interested in reading and writing and is more likely to have been interested in commemorating her father’s fate. During her younger years Anna Banér was a lady-in-waiting to Queen Mother Katarina Stenbock at Strömsholm farm in Västmanland. Katarina Stenbock was a niece of Anna Banér’s maternal grandmother, Märta Leijonhufvud. On 7 October 1610 Anna Banér married the privy councillor and baron, later count of Korsholm and Vasa, Gabriel Bengtsson Oxenstierna, cousin of the chancellor of the realm, Axel Oxenstierna. The couple had many children. Their first child, Sigrid, was born in Nyland, Finland on 15 September 1612. Anna Banér subsequently gave birth to another ten children in rapid succession in the years between 1613 and 1626. During these years Anna Banér moved between Finland, Sweden and Estonia, where her husband, Gabriel Oxenstierna, became regional governor of Reval (modern Tallin). Four of her children were born at Reval castle. In 1620 her daughter Anna was born in Stockholm, as were the next four children. At the time Anna Banér and her family were settled in Uppland near her husband’s ancestral property, the Mörby castle in Norrtälje commune. In 1623 Anna Banér donated an altarpiece and pulpit to Fasterna church. Twelve years later, in 1635, she had the Oxenstierna family grave erected in the church chancel. From 1631 to 1634 her husband Gabriel served as governor-general of Finland. He returned to Stockholm in 1634 upon being appointed treasurer of the realm during the minority government of Queen Kristina. From this point on Anna Banér was permanently settled in Sweden. In 1634 she and her husband initiated the building of Rosersberg castle in Norsunda parish, just to the north of Stockholm. The castle was completed in 1638. 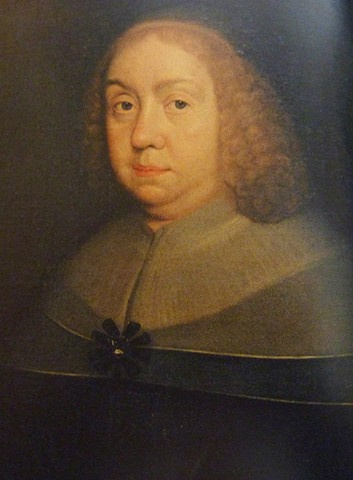 In 1639 Anna Banér’s husband’s cousin, Axel Oxenstierna, who was chancellor of the realm, suggested that Anna Banér should become foster mother and guardian of the then 13-year-old Queen Kristina. Anna and Gabriel Oxenstierna declined the suggestion with reference to their own sizeable family. Anna Banér died in 1656 at the age of 70 at Rosersberg castle. She was buried at Fasterna church. The church floor contains a slab bearing both her name and that of her husband. Anna Banér, www.skbl.se/sv/artikel/AnnaBaner, Svenskt kvinnobiografiskt lexikon (article by Annika Sandén), retrieved 2019-04-20.